How did you come up with the idea for God’s Great Plan? When my first child was born, I found several great story Bibles but none that focused solely on the gospel. 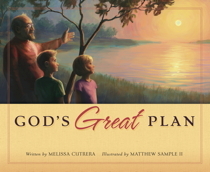 I wanted to share the gospel with my children from birth, so I set out to write God’s Great Plan as a book just for my son. I intended it to be a resource I could use in our own home to introduce him to the grand narrative of creation-fall-redemption-glorification. What was your writing and publishing process like? I wrote the first seven couplets of God’s Great Plan on the back of an envelope while nursing my weeks-old son. Over the course of the next year, I can’t say I was all that consistent in writing while raising a newborn! Off-and-on, I would think through one couplet at a time while pushing my son in his stroller. I would rehearse the couplets over and over in my mind, trying to get the words right, and then write them down when I got home. It took me full year to write the manuscript. I had three friends proofread it for me, and all three suggested I send it to a publisher. I spent some time researching various publishers and settled on Shepherd’s Press because their mission statement lined up perfectly with my book. By God’s grace, they were immediately interested, and we began praying, waiting, and communicating through the publication process. Why did you choose to write in this particular style – using short, rhyming couplets? Well, you have to remember that at the time I wrote God's Great Plan, my daily reading consisted of Good Night, Moon, Where's Spot?, and something about finding a pig. I was immersed in rhythm and rhyme and was quickly discovering that my son liked books best when the text was short and the words themselves added to the fun. I wanted to share the gospel in a way that would be pleasant to hear again and again. Perhaps my greatest motivation, though, was to write something my son would be able to remember and repeat in a moment of need or in his own early efforts at evangelism. I hope that when he is convicted of sin, he'll remember: "Now each one who trusts in Christ Jesus alone / Is forgiven of sin and made one of God's own." Or that when he's telling a friend about Christ, he won't forget to mention His sinless life, because he'll know: "He always obeyed, and He did what was right / He loved God the Father with heart, soul, and might." What has God taught you through the writing of God’s Great Plan? Honestly, the biggest truth I've learned - and it's one that I continue to wrestle with - is that my daily parenting is so much more important than anything I create on a larger scale. My kids like the book, and they think it's neat that I'm an "auffer," but it's not through God's Great Plan that they're learning how practical the gospel is. It's through me coming to them on an almost daily basis and saying, "I'm sorry I got angry with you (again). I was wrong. Mommy's a sinner. I do bad things. But God loves me anyway. He sent Jesus to die for my bad things. And I trust in Jesus. I hope you will trust in Jesus, too. And you can be close to God even though you're a sinner." Along these same lines, I'm also learning that if I'm neglecting my kids for the sake of my writing, then I'm not writing for them. I'm writing for me. I don't want to be a selfish writer. I want to be a selfless parent, but I'm definitely not there yet. I'm also growing more excited about God giving His children creativity for the purpose of advancing his kingdom. I want my kids to see me using whatever gifts God grants. God's Great Plan being published and made available to other families has given me a vision to develop and encourage creativity in my children. I pray they will grow up to infuse our culture with light through their unique gifts and abilities. To receive a free, printable discussion guide to accompany God's Great Plan, sign up for my weekly devotions.